Many potting soils become hydrophobic—tending to repel water—when they dry out, and are difficult to re-wet. 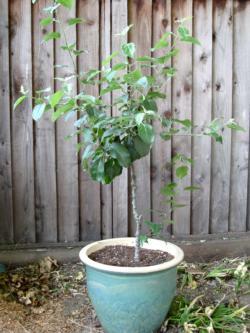 Gardeners may see water draining out the bottom of a pot and assume that means that the soil is saturated. But the water might be running between the side of the pot and the hydrophobic root ball instead, barely wetting the outer surface and leaving the center of the root ball dead dry. Small seedlings from nurseries are particularly prone to this, especially if they have become rootbound. It can happen to large container plants as well. Potting soils often contains peat moss which is valued because it decomposes slowly, is lightweight, and retains water. Paradoxically though, when peat moss dries out it is very difficult to re-wet. Bags of potting soil can even dry out in storage. Submerge the whole pot in a bucket of water. This is drastic but fast. Initially there will be so much air in the root ball that the pot will float. When holding it under water, you will see the air bubbles escaping as the air is displaced by water. Remove the pot once the bubbling stops. Set the pot in a shallow container of water (if size allows), allowing the soil to slowly absorb the water. This technique is known as bottom watering. It may take an hour or more to thoroughly re-wet the soil. Be careful not to leave pots soaking in standing water continuously. Check them after an hour or two and remove them when they are hydrated. For large containers that can’t be lifted easily, you will need to trickle water onto the soil slowly enough that the water has time to absorb instead of running off. If using a hose on a very slow trickle, be sure to set a timer so you don’t forget about it. If rain is forecast, you can let the rain do the work for you. Notice that just as a full glass of water weighs more than an empty glass, a well-watered pot will be heavier than a dried out one. Get to know how heavy a well-watered pot should feel. Hard-packed clay soils and even garden soils can become crusted and resist wetting, letting water run off instead of absorbing it. To re-wet, repeatedly sprinkle the surface lightly, making sure there is no run off. Covering the surface with a mulch such as straw, leaves, wood chips, or compost will also help. Eventually the soil will become moist enough to break up. A gentle, steady rain will also do the trick. Coffee grounds make an excellent mulch and compost ingredient. But if firmly packed nuggets of fine espresso grounds dry out, they can become hydrophobic. Take care to break them up, especially if using directly as mulch.